This is not an event where writers sit around a table spitting saliva all over each other fighting for a chance to get the attention of the agent they strapped to the center, all while spewing their loglines. Oh no, this is much safer…and dryer. I promise. This is a wonderful contest hosted by the contest queen herself, Brenda Drake. What’s great about this particular contest is the winning entrants get mentored by either an agented (and published) author or a professional editor. These are people who’ve been in the trenches and/or worked in the writing industry long enough to offer priceless feedback. And further, they will critique the winner’s entire manuscript. That’s right…THE WHOLE ENCHILADA. And after months of the winners pulling their hair out making all requested edits, they will be rewarded with an agent round. It begins November 4, 2014. What does that mean? 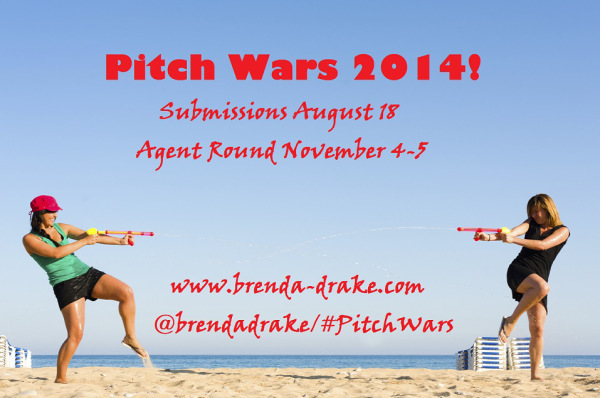 The participating agents will begin requesting their favorite entries to read from pitches posted to the blog. This years agents haven’t been revealed yet, but you can go here to see the agents from the previous Pitch Wars. You must have a polished manuscript to enter the contest, but no worries because submissions start August 18, 2014. But know, this date will fall upon you before you realize. So, get to crackin’, er tappin’! And don’t forget, check out the mentors for this year here and be sure to follow Brenda’s blog for updates on the contest. As always, good luck and happy writing.